Water ionizers are designed to purify water supplies by using electrolysis to increase the alkalinity and pH of the water. This provides many health benefits. Have you been considering buying a water ionizer for your home because of water quality problems? This review looks at the pros and cons of water ionizers and the health benefit claims. It also describes how they work and how they improve the quality of drinking water. This will help you decide whether or not to buy a water ionizer unit for your home. There is a lot of debate about the health benefits of alkaline water produced by water ionizers. Either you are a believer in the benefits or not. The process involves filtering and increasing the pH of your water supply and the concentration and negative ions in it, using an alkaline water ionizing machine. The technique employs electrolysis, that electrically separate the positive and negative charged ions in the water. Most water from rivers, streams, water reservoirs and lakes is alkaline, and is strongly buffered with calcium carbonate and other minerals that keep it alkaline. Rain water is neutral with a pH of 7.0, and has no buffering capacity. The process of acid-rain caused by pollution, makes some water supplies acidic. Some rivers and lakes are naturally acidic, but these are uncommon. Those who believe in the health benefits of alkaline water machines, believe that ingestion of alkaline water neutralize toxins in the body and provides antioxidant properties. They claim that humans were designed to drink alkaline water, that water ionizers provide many health benefits. Others say that the human body can buffer pH of the water consumed, and that the health benefits are minimal at best. A lot depends on the quality of the water in the local source and whether you are concerned about the acidity created by the processing needed to make it fit for drinking. Many chemicals added to render it safe, such as chlorine, make the water acidic. USA Seller! Faster shipping, it takes 1-3 days. What are the Various Methods of Water Purification? (4) the expected health-benefits to you and your family. It is important to note that there is a difference between water filtration and purification. Water purification describes the elimination of chemical contaminants and microbes from your water supply. This can done by irradiating the water with UV light, adding a disinfectant such as chlorine or changing the chemical composition of the water using a water ionizer. Water filtration systems can remove particles and some chemical contaminants by binding them in ion exchange systems or using activate charcoal. However filtration units are not designed to remove microbes such as bacteria from the water. These units are not "purifiers" in the strict meaning of the word. Understanding how water ionizer work will help you decide whether you should buy one and whether it will solve your particular water problem or health issue. 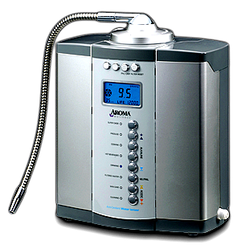 An ionizer has an electrolysis unit inside, that uses electricity to separates the ions in the water. The processed water is divided into two chambers - one containing the acidic water and ions, and the other the alkaline water. Alkaline water contains a variety of positively charged ions such as magnesium, calcium, sodium and potassium which buffer the water and keep it alkaline. This fraction is ideal for drinking and cooking. The acidic water, which contains ions such as fluorides, chlorides and nitrates, is excellent for washing fruits and vegetables, but not for drinking. An electric ionizer can be connected very easily to your cold water tap and placed either under the sink or on your bench top. It is claimed by many, without scientific proof, that ionized and alkaline water is an antioxidant that reverses the process of oxidation within your body. Can Alkaline Water Ionizers Electrolyze Distilled Water or Tank Water? Pure water, such as tank water or rain water, is a poor conductor of electricity and so it cannot be electrolyzed to any degree. The best source water is relatively hard water (meaning, it contains minerals like calcium or magnesium). Is the pH of the Water Important? Ionized water doesn't change the acidic levels of your body, as the stomach is very acid. It is not the pH that is important it is the alkalinity - that is the ions in the water that are important. Do Alkaline Water Ionizers Filter the Water? Ionizers are only basic water filters and therefore not as effective as a purpose-designed drinking water filters. If you're concerned about the general quality of your water supply (and you should be), you'll need a home water filtration system, not an alkaline water ionizer. Pros: These units include both filters and ionizing processes using electrolysis. The higher pH of the water and the alkalinity have been claimed to neutralize toxins in the body, helps to strengthen the bones and to boost the immune system. Many people who drink alkaline water report almost immediate boosts in energy and increased vitality, but there is no scientific proof to these claims. Cons :The units are expensive and the health benefit claims are not verified. Speak to some one who has a unit or study the reviews. Useful information. I just plan to get a water ionizer. Your advice is important to me. Thanks. Good reviews on Water Ionizers, why not try a water distiller? A alkaline water purifier seems good and I'll have a try. wow really informative post, i never thought of these things before buying purifier, in fact no one know before they read or find something inside, we just tend to buy any water purifier out there and drink water without thinking of its cons on our health. informative info. I just need to buy a water ionizer recently. Help me a lot. Great article. Easily explains a complex scientific topic. Though the units are costly, and health benefit claims are not verified, there's no doubt that they at least purify the water well. I would say it's worth the investment. Save money and time with at home medical test for allergies,cholesterol, ovulation, cardiac, STD's, urinary tract infections, blood alcohol, HIV and much more. All FDA approved. A milestone for every parent is a baby’s first tooth. It starts a process that lasts their whole lifetime and its important to set our kids up for success.